Handy single-portions (10 bags 45g each) to take- and give-away. 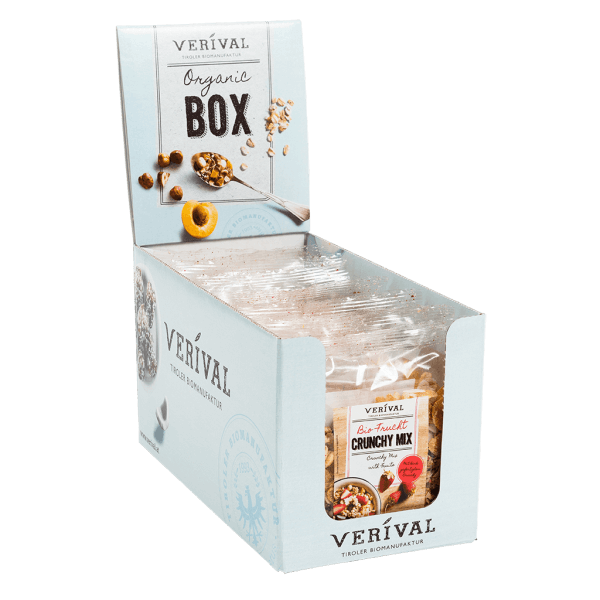 Gently toasted crispy oats with cornflakes and puffed wheat, lightly sweetened with honey and mixed with sultanas, coconut chips, peach, sour cherries, forest berries and toasted hazelnuts. Plus a pinch of cornflower and sunflower petals. Deliciously crunchy and 100% organic. Good morning! Crunchy* 51,9% (wholegrain oat flakes* 59,3%, raw cane sugar*, high-oleic sunflowerseed oil*, coconut rasps*, rice crisps*, salt), cornflakes* (corn* 90%, raw cane sugar*, salt, barley malt*, corn starch*, stabiliser: gum arabic*, emulsifier: sunflower lecithin*), sultanas* 10% (sultanas 99,5%*, sunflower oil*), puffed wheat with honey* (wheat*, honey* 30%), coconut chips* 6%, apricots* 6% (apricots* 97%, rice flour*), sunflower seeds*, roasted hazelnuts*, sour cherries* 1,5%, berries* 1% (strawberries*, raspberries)*), cornflower blossoms*, sunflower blossoms*. > May contain traces of other nuts, lupines, sesame seeds and soy.